UPDATE: Brandon received his transplant on June 22, 2013 and is on the road to recovery. Brandon and his family greatly appreciate your continued support! 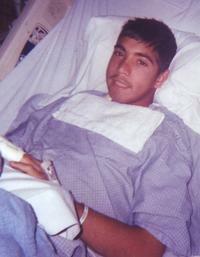 We need your help so that 15 year old Brandon Ortiz can get a desperately needed kidney transplant! As many of you know, my son, Brandon has been battling end stage renal disease for the last few years. He recently started dialysis treatments, which he endures three times a week to stay alive. This is only a short term solution; Brandon needs a kidney transplant soon. At the moment, Brandon is still going to high school and this means a lot to him. Brandon has insurance coverage, which is a blessing, but it will not cover all of the expenses to receive a kidney transplant. He is being seen at the University Medical Center in Las Vegas but they will not put him on the wait list for a kidney until he can raise enough money to cover his post-transplant medications. He will need $20,000-$40,000 for these medications which are critical to make sure that his body does not reject the new kidney. Brandon will need to take these medications for the rest of his life. I am raising Brandon and his sister on my own. Brandon’s father is critically ill with stage four colon cancer and is unable to help in any way. I just don’t know how I can do this without help. To help with this financial burden, a fundraising campaign in Brandon’s honor has been established with HelpHOPELive, a nonprofit organization that has been assisting the transplant community for 30 years. All donations are tax-deductible, are held by HelpHOPELive in the Southwest Kidney Transplant Fund, and are administered by HelpHOPELive for transplant-related expenses only. Your contribution is greatly appreciated.Together, we can make a difference. Please help my son get his second chance for life. Thank you for your kindness and generosity. Hi Brandon, I am your cousin Yanez. I just wanted to let you know that I will pray for you so that you can get a kidney transplant soon.